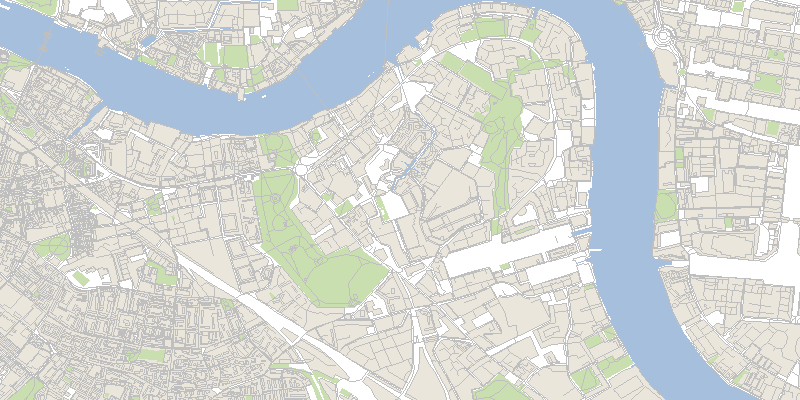 I’ve been playing with maps for the past few weeks in an effort to find the best location for my next flat, cross-referencing several data sources to assign scores to offers from agencies and property owners. The rendering on its own is clearly inferior to Google Maps, but the data itself is very valuable: being able to understand how streets are connected together makes it possible to implement search algorithms on top of a graph representation of the city. So instead of focusing my efforts on building a better renderer, I’ve decided to keep using Google Maps as a background image only and to implement my application using simple projections on top of that background. In my quest to add relevant data sources, I downloaded a copy of the Transport for London (TfL) schedule list, describing each train, bus, or boat and its planned stops with their geographical location. The files are in a TfL-specific format, which can be converted to the more accessible GTFS. An application that builds on several input feeds to print out a result based on their interaction needs cleaned-up data sources with minimal bias or error rates. In order to make sense of the TfL schedules, I plotted the journeys of every vehicle I knew of, looking for obvious gaps in the data. 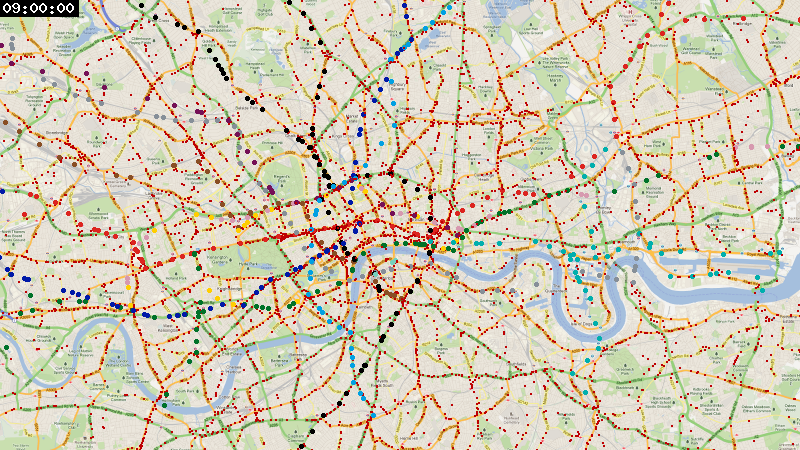 Tubes and the DLR are plotted with coloured circles, while buses are represented as red squares. I am confident that I have enough data to use in my application, even though there seem to be some minor issues with buses. London has a lot of buses, but they tend to stay on major roads. 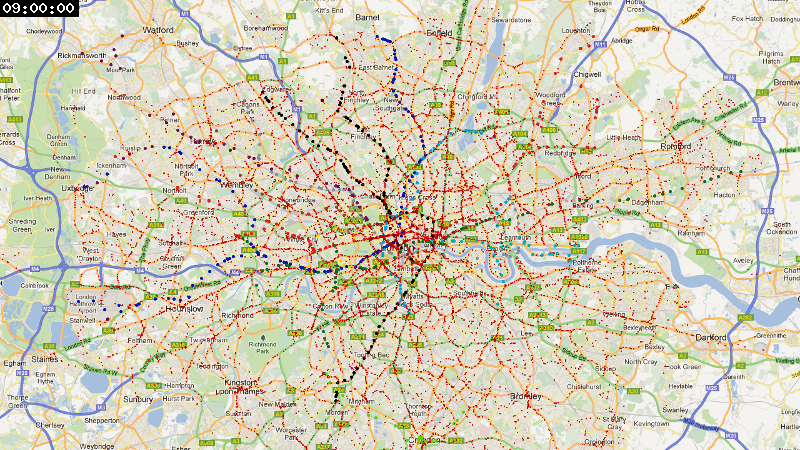 Even though the points represent planned journeys, TfL lines are subject to frequent outages at all hours of the day. The videos are… kinda cool but also a bit boring, as nothing really stands out. The code is available on GitHub, but you will need a converted GTFS dump of the TfL data to run it yourself. Background images are © Google. Follow me on twitter for more experiments like this one. A few weeks ago, I was asked to review a coworker’s PHP code, which provides an API for a web game. The specifications for this API were sent to a mobile development company, in charge of making an iPhone app for the game. All requests from API clients had to be signed using the SHA-1 hash function, prefixing the message with a salt for security reasons. I pointed out that this was probably not safe, and here is a detailed explanation of why. Please note that I am not a cryptographer, and that you should take my advice with a grain of salt. = "18d2fccddeba1b08304fb53e849be5711d55b2e0". This is included in the packet we’ve intercepted. The SHA-1 algorithm is simple; it starts by padding the message with zeros up to a multiple of 64 bytes, and processes each 64-byte block of the message in sequence using the hash of each chunk to compute the next. It also includes the message’s length as a 64-bit integer at the end of the last 64-byte chunk. This chunk is 64 bytes long, it starts with the salt, followed by the message, followed by a single “1” bit (0x80 is 10000000 in binary), followed by padding zeros and the length in bits of our input: len(salt) + len(msg) = 11 + 25 = 36 bytes = 288 bits = 0x120 bits. This single chunk c0 is hashed using SHA-1’s default seed values: h0,h1,h2,h3,h4 = 0x67452301, 0xefcdab89, 0x98badcfe, 0x10325476, 0xc3d2e1f0. We can add data to this message by creating a second chunk. This means considering that first chunk as the beginning of a new message, and injecting data only after the first 64 padded bytes. Because SHA-1 reuses the output of the first chunk as the initial h0..h4 values to process the second chunk, we can compute the hash of (c0 + injected data) by reusing the initial hash and only hashing the second chunk. Our new message will contain the paddings zeros and the first original size, but that’s not really a problem with a PHP target. The injected string is 20 bytes long, which means that the complete message is 64 + 20 = 84 bytes = 0x2a0 bits. As we saw, hashing c0 produces 18d2fccddeba1b08304fb53e849be5711d55b2e0, which is split into h0..h4: 0x18d2fccd, 0xdeba1b08, 0x304fb53e, 0x849be571, 0x1d55b2e0. Those values will be used as the input of the main SHA-1 loop, in order to process the second chunk as if it was the continuation of the first. Processing that second chunk with the custom h0..h4 values generates the following hash: 5a77fe8376811dbf7533509cceb6c8c53f98e253. This message is made of the end of the first chunk with our guess of an 11-byte salt, to which we have added our new data. $msg = urldecode($_SERVER['QUERY_STRING']); // read input. $signature = sha1($salt . $msg);	// compute signature. Producing 5a77fe8376811dbf7533509cceb6c8c53f98e253, which is what we had predicted. We have added data to our message, and used the original hash to sign the new chunk. And the signature is correct, too! The transaction is executed. Don’t use a hash function as a symmetric signature. I highly recommend this 1-hour presentation on cryptography by Colin Percival, which includes specific dos and don’ts for different use cases: (PDF), (video), (Hacker News discussion). A demo code for this article is available on GitHub. If you enjoyed reading this article, you should follow me on twitter.